Do you know what is your child’s age requirement to sign up online? As the Internet permeates every aspect of the economy and society, it is also becoming an essential element of our children’s lives. While it can bring considerable benefits for their education and development, it also exposes them to online risks such as access to inappropriate content, harmful interactions with other children or with adults, and exposure to aggressive marketing practices. Children online can also put their computer systems at risk and disseminate their personal data without understanding the potential long-term privacy consequences. Beside support and guidance from parents when using the online environment, an appropriate mental development and understanding is important for a child when using an online platform. For these reasons, in both the United States and the European Union, a minimum age requirements for accessing the “online world” was set as a legal requirement. E-Crime Expert thinks that the minimum age requirements a child should meet when signing up for an email account, Facebook, etc., should be a topic of interest for parents. For these reasons, we researched the minimum age requirements on some of the most popular online sites and platforms. In the European Union, the European Commission released in January 2012, a Proposal on the protection of individuals with regard to the processing of personal data and on the free movement of such data (General Data Protection Regulation). This Proposal has specific requirements with regards to Children. They deserve specific protection of their personal data, as they may be less aware of risks, consequences, safeguards and their rights in relation to the processing of personal data. To determine when an individual is a child, this Regulation should take over the definition laid down by the UN Convention on the Rights of the Child. For the purposes of this Regulation, in relation to the offering of information society services directly to a child, the processing of personal data of a child below the age of 13 years shall only be lawful if and to the extent that consent is given or authorised by the child’s parent or custodian. The controller (i.e. the person in charge with the collection, use and disclosure of personal data) shall make reasonable efforts to obtain verifiable consent, taking into consideration available technology”. How old do you have to be to sign up for Facebook? In order to be eligible to sign up for Facebook, you must be at least 13 years old. The minimum age requirement on Facebook is more or less enforceable. Simply lying about your birthdate easily circumvents the policy. The Children’s Online Privacy Protection Act (COPPA) mandates that websites that collect information about users aren’t allowed to sign on anyone under the age of 13. As a result, Facebook’s Statement of Rights and Responsibilities require users of the social network to be at least 13 years old (and even older, in some jurisdictions). 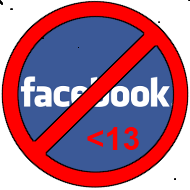 According to MinorMonitor, over 38 percent of children with Facebook accounts are 12-years-old and under. Even more worryingly, 4 percent of children on Facebook are reported to be 6-years-old or younger, which translates to some 800,000 kindergarteners on Facebook. These results come from a survey of 1,000 parents of children under 18-years-old who use Facebook. The company provides a free, web-based parental tool that gives parents a quick view into their child’s Facebook use, including potential dangerous activities such as the friending of online predators, cyberbullying, violence, drug and alcohol use, as well as sexual references. YouTube: When a YouTube video has been age-restricted, a warning screen is displayed and only users who are 18 or older can watch it. Learn more about age-restricted videos. When a child under age 13 attempts to register with Yahoo!, they ask the child to have a parent or guardian create a Yahoo! Family Account to obtain parental permission. Yahoo! does not contact children under age 13 about special offers or for marketing purposes without a parent’s permission. Yahoo! does not ask a child under age 13 for more personal information, as a condition of participation, than is reasonably necessary to participate in a given activity or promotion. Yahoo! is concerned about the safety and privacy of all its users, particularly children. For this reason, parents of children under the age of 13 who wish to allow their children access to the Yahoo! Services must create a Yahoo! Family Account. When you create a Yahoo! Family Account and add your child to the account, you certify that you are at least 18 years old and that you are the legal guardian of the child/children listed on the Yahoo! Family Account. By adding a child to your Yahoo! Family Account, you also give your child permission to access many areas of the Yahoo! Services, including, email, message boards and instant messaging (among others). Please remember that the Yahoo! Services is designed to appeal to a broad audience. Accordingly, as the legal guardian, it is your responsibility to determine whether any of the Yahoo! Services areas and/or Content are appropriate for your child. II. Second attempt, indicating the user is 13 years old. “Jurisdiction’s Restrictions: If the law of Your country prohibits You from downloading or using Skype Software because You are under the age limit or because the Skype Software is not allowed in Your country, please don’t use it”. According to this, for US the minimum age requirement is 13 + (COPPA). For more advice on how children could stay safe online (you could also share this with your child), click here to visit the material E-Crime Expert specially created for this purpose. Hit the “subscribe” button in order to be notified when new videos and Articles are posted on this blog.